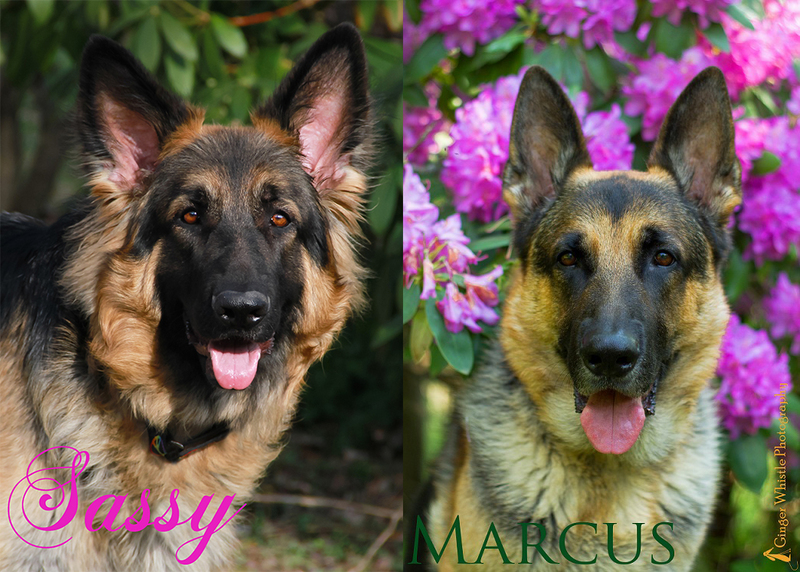 This was the blog we kept for our 2010 Sassy & Marcus litter. Because we got so many positive comments on it, we decided to keep a blog for our subsequent Leila & Junior breedings, too. 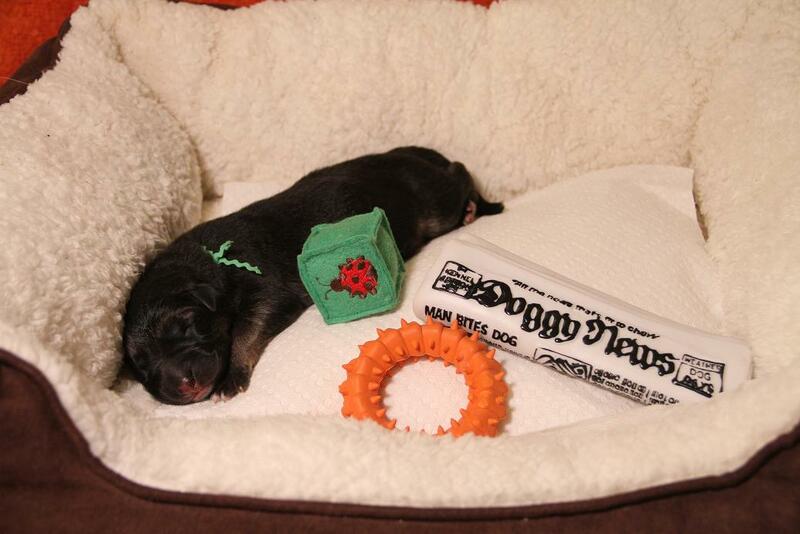 This blog will give you an idea of the kind of attention and care we give to our litters. 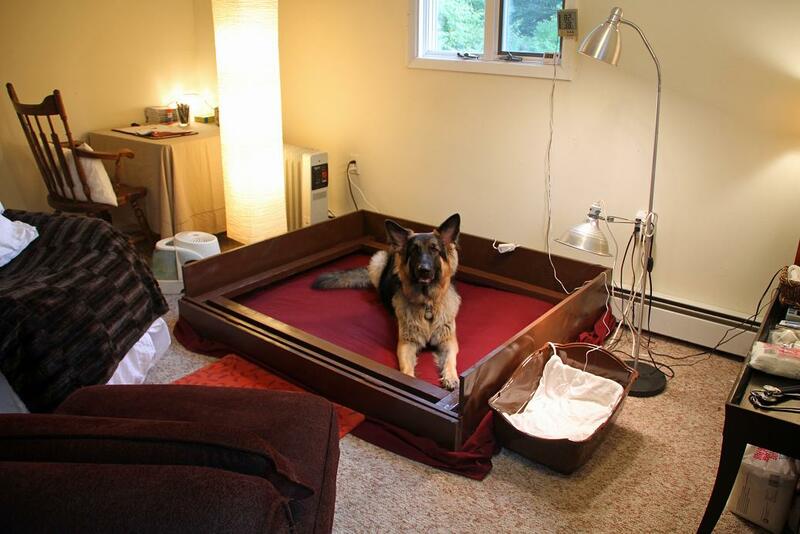 We completely emptied out a spare room and converted it into our whelping room. 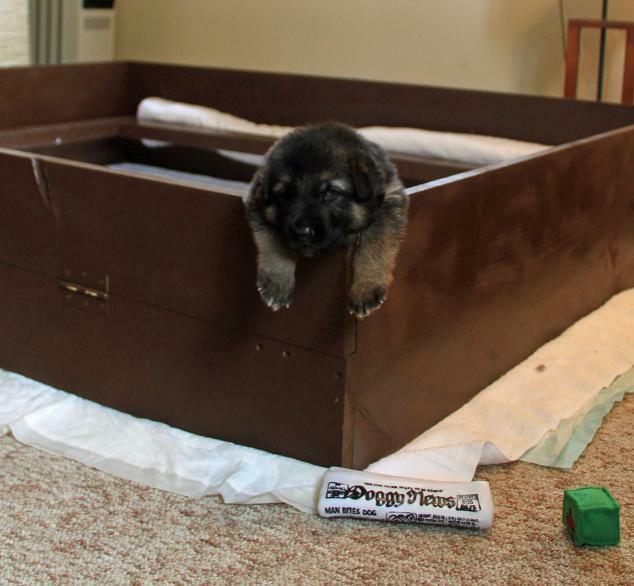 Here is Sassy getting used to her custom whelping box. 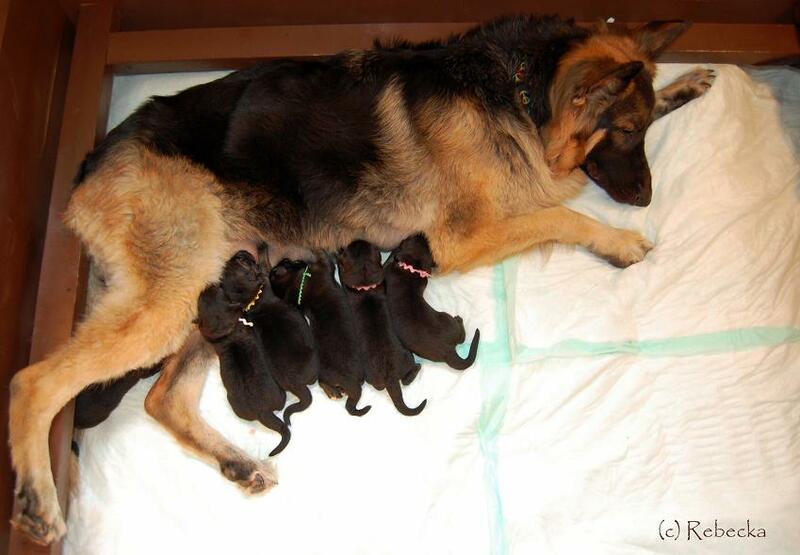 She was measured, and it was built so that she can sprawl out comfortably when she nurses the pups. Another view. 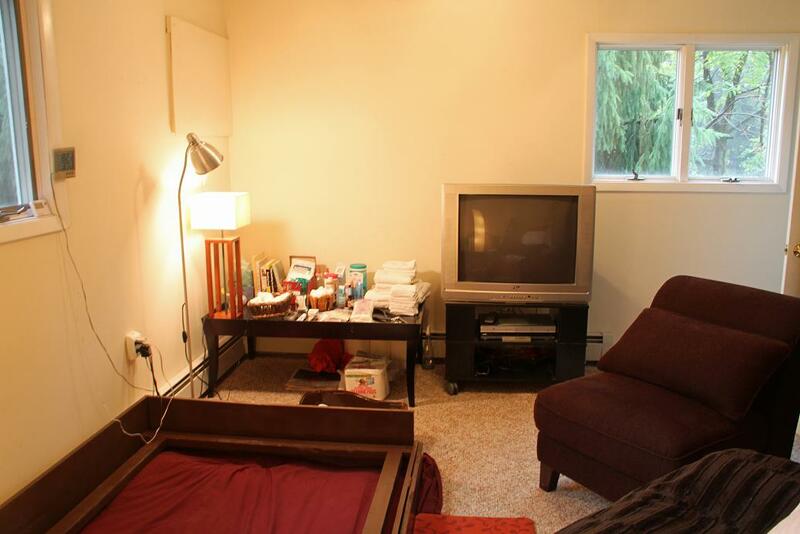 We added a television to pass the time. My corner, with a table to keep all the records, and where I will put my laptop and camera equipment. 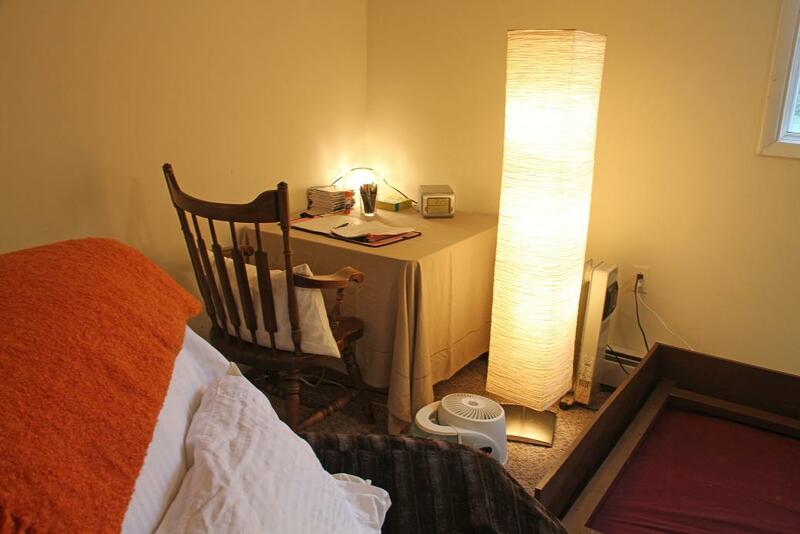 In the foreground below is a recliner we made up with bed linens, because the whelping will invariably take place in the middle of the night, and last for many hours. We humans want to be comfortable too! 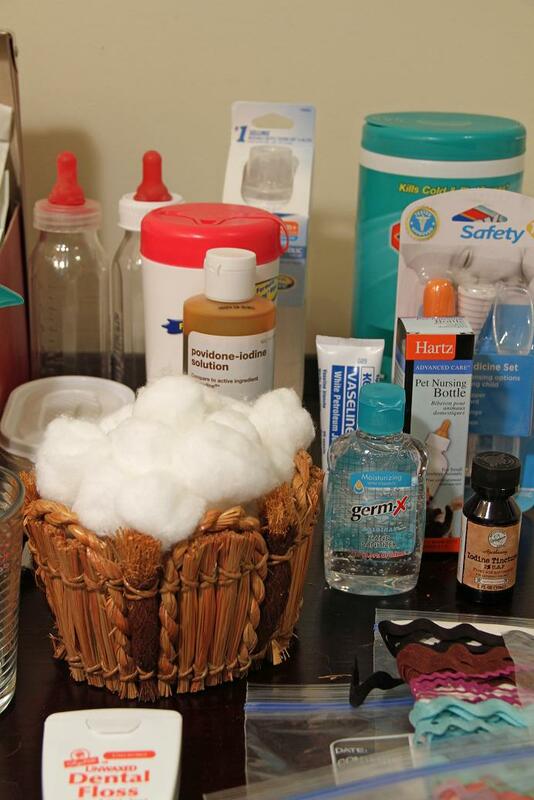 Supply table. I think we are equipped to do everything short of a C-section! Some of the books I’ve found helpful in preparing for the big day. 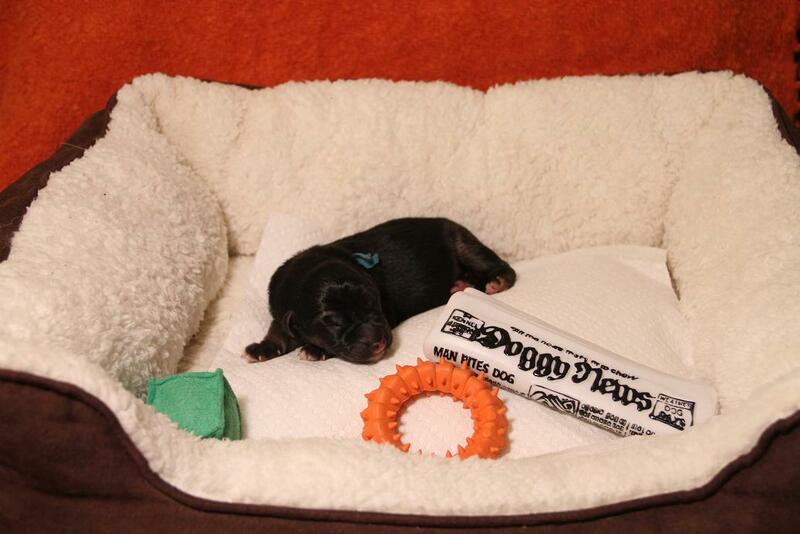 Thermometers for both the whelping box and the puppy box. Now all we need are the puppies, Sassy! 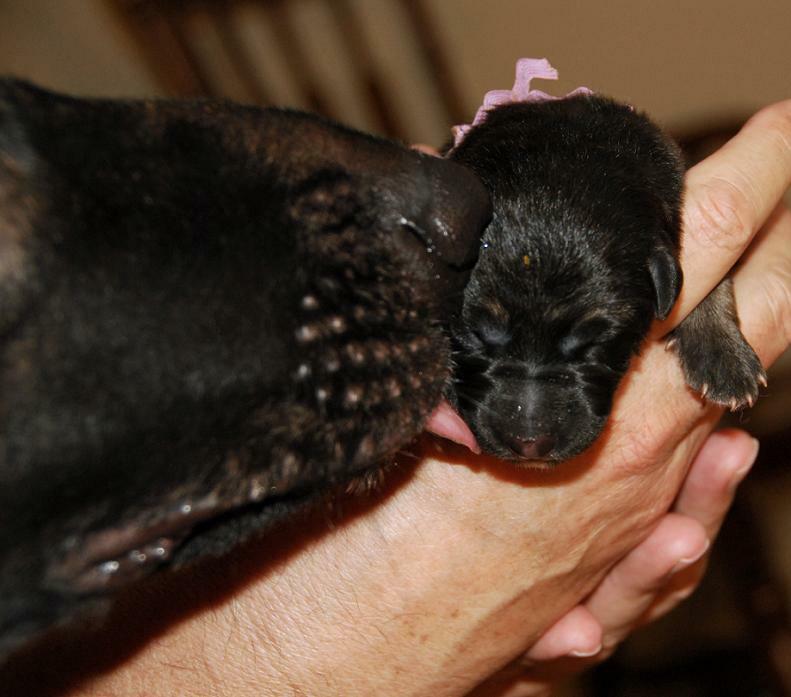 2:35am – Sassy gave birth to her first puppy, and officially became a “dam!” “Violet,” as we will call our first girl, weighed in at a healthy 20 oz. She was wiggling right from the start, and wanted to drink right away. We dried her off, tied and cut the cord, and put her on her mom to drink. 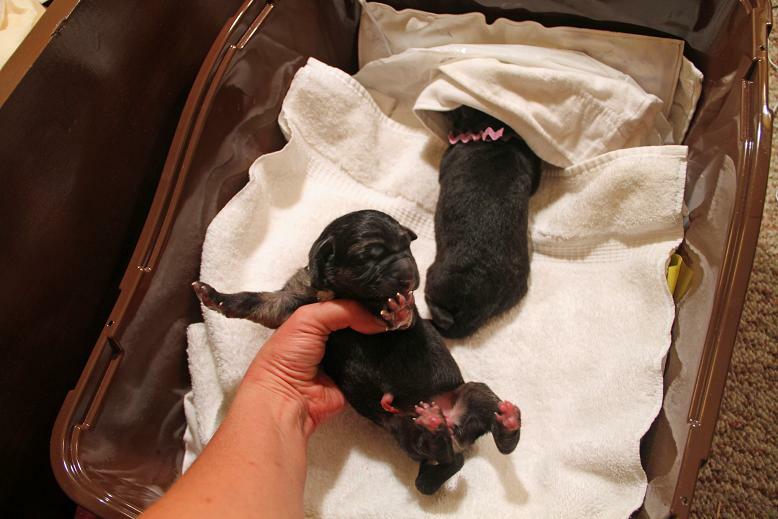 Shortly after she started to nurse, Sassy got up and had number 2! The second girl we will call “Rose.” Rose was 20.9 oz, born at 2:56am. Good set of lungs on her! 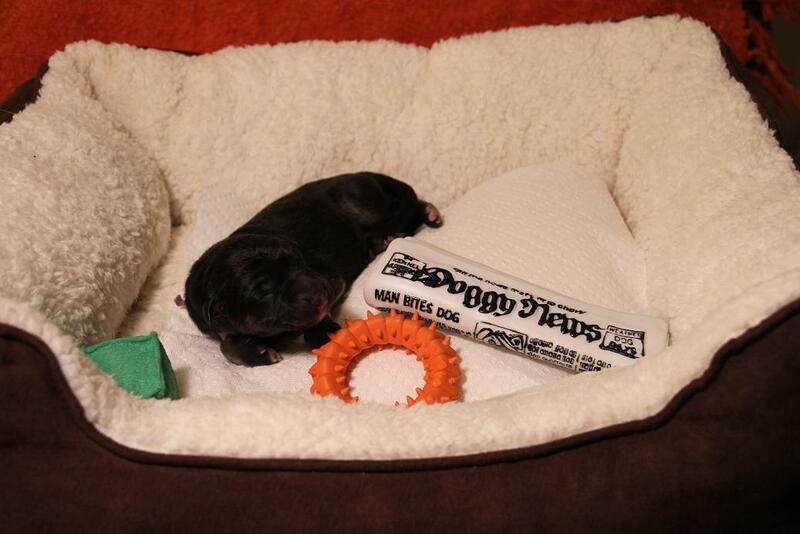 Both pups are free of birth defects, and have already received a good helping of colostrum. We are amazed at how easily Sassy delivered these two. No yelping, and they just sort of popped out! 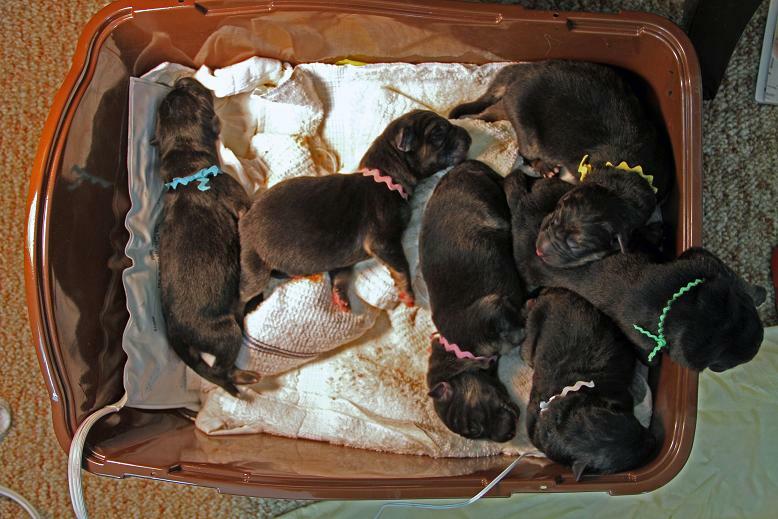 9 am – here are the 6 so far, 4 girls, 2 boys: Bluebeard, Rosie, Violet, Lemondrop, Greenbean and Blanche. She may have a couple more. 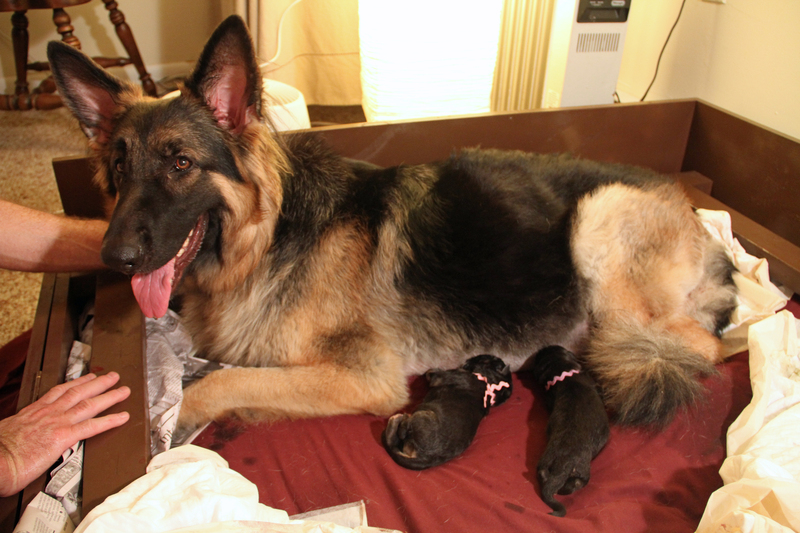 11 am – It looks like it will be six puppies total. That’s quite enough! They are all big and strong and different already. Greenbean has a big mouth — this boy can yell! Lemondrop is shy and needs help to find a teat. Violet seems almost a day older than the others, maybe she was conceived earlier. 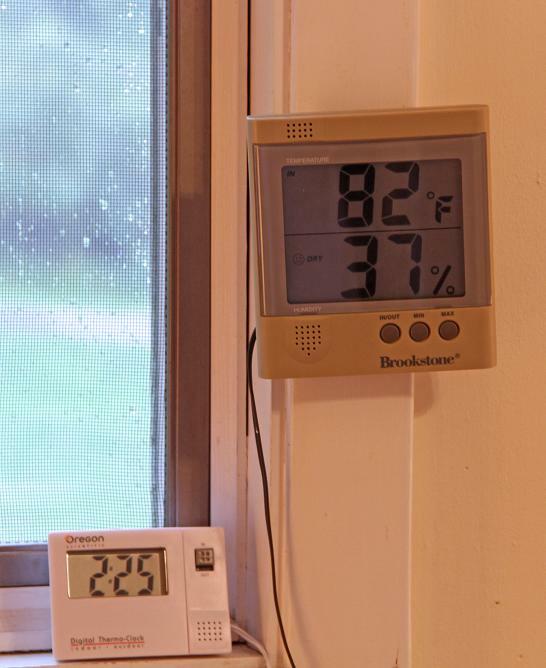 She is warmer – panting at the same temp as the others, and is getting around better. Rosie always wants to sleep with her head hanging out of the puppy box. Bluebeard is an absolute cuddly thing; I don’t know why, but he just makes me laugh. And Blanche is sweet, calm and easy. Sassy is not yet interested in the puppies. We are having to hold her to allow them to nurse. She may be just exhausted. She ate a nice meal of chicken and rice, drank some broth, and is now peacefully sleeping in the corner of the whelping room. 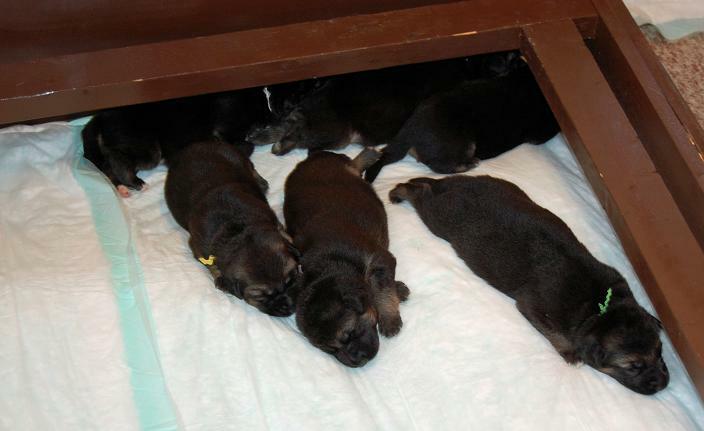 All six puppies gained weight today! Here are their vital birth stats. We took Sassy to the vet this afternoon, and they gave her an injection of Oxytocin. All is well, and she is sleeping like a baby after nursing again just now. 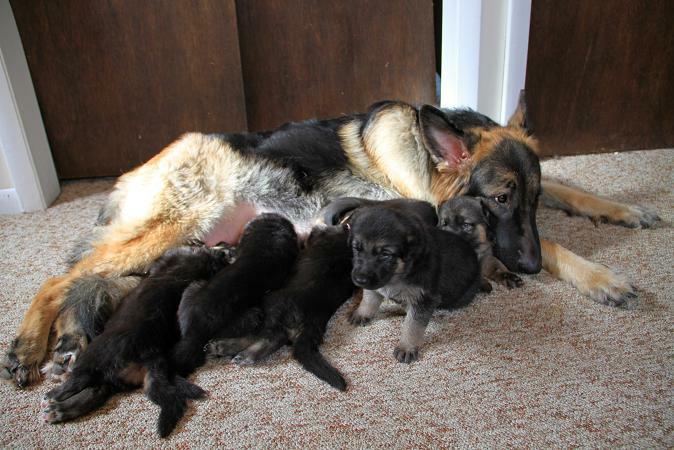 The pups ate six or seven times today. One more midnight feeding and then I’ll sleep until the early feeding tomorrow morning. And the Piggywig Award for today goes to…. Blanche! 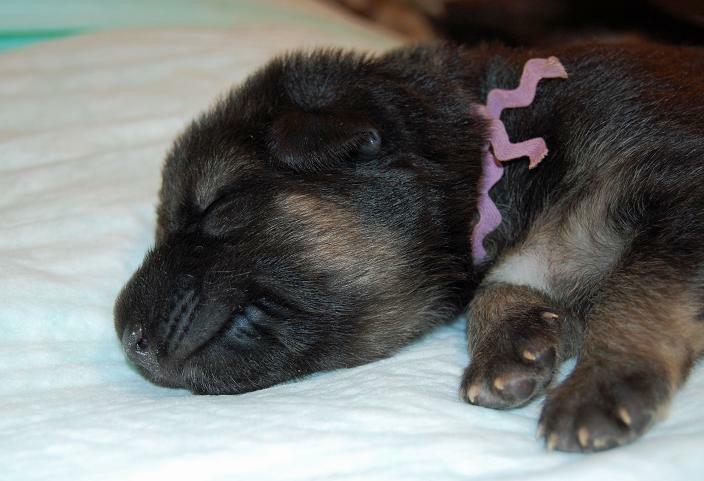 Blanche has gained 16.1% of her total body weight since birth. 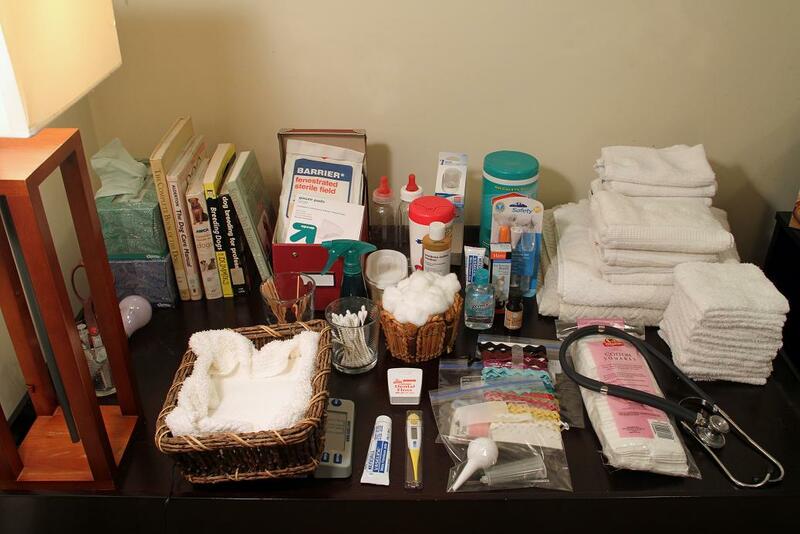 Way to nurse, little girl! 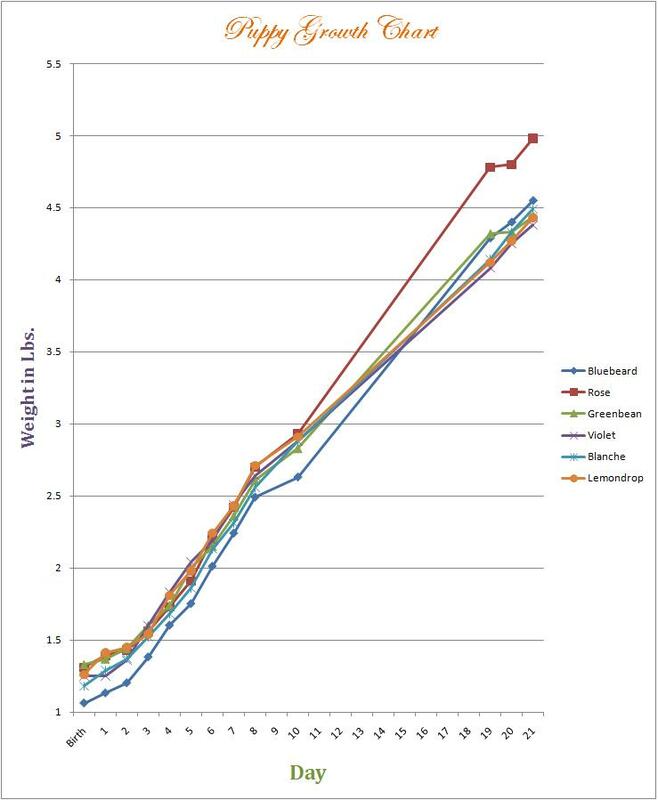 As Greenbean was the heaviest at birth, it makes sense that he has gained the least. The lighter ones are “catching up.” All this weighing in (twice a day) helps us ensure that each puppy is healthy. 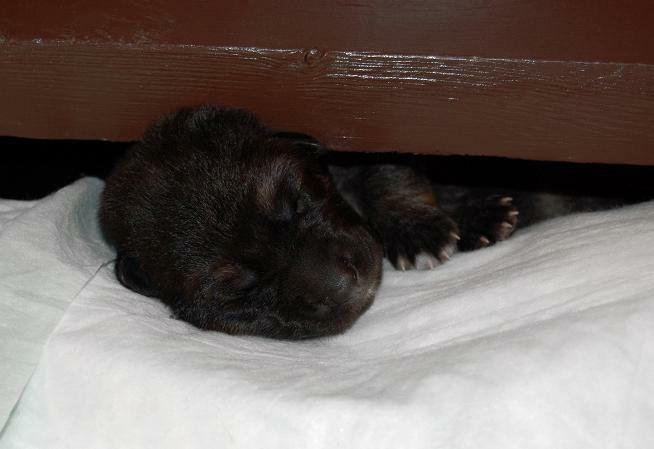 Sassy is also expressing more interest in her puppies, nuzzling and licking them, and going into her box by herself to lie down and open up Mom’s Cafe. It looks like the mothering instincts are kicking in. 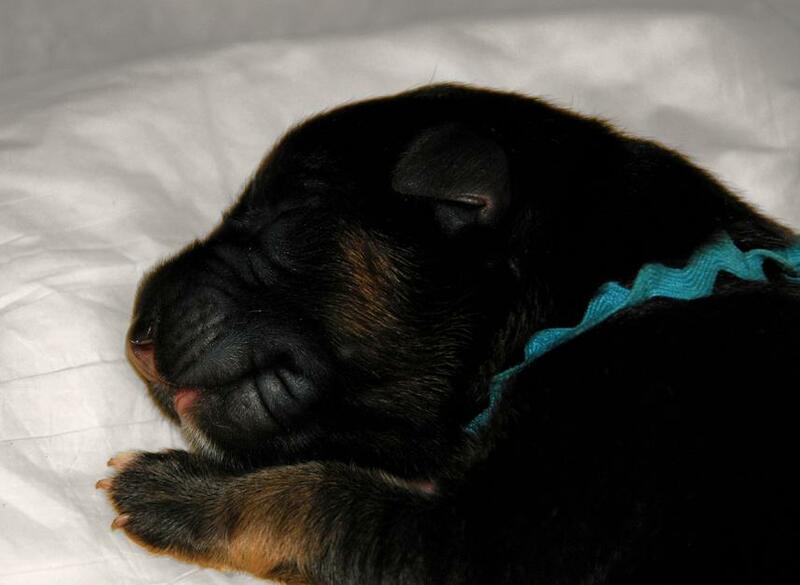 Puppy portrait at 3 days old. All puppies doing great and growing well. Updated for Day 5. It’s incredible to watch them grow. They have doubled in size. Every time we see them, they are visibly bigger. Their personalities are becoming more apparent. 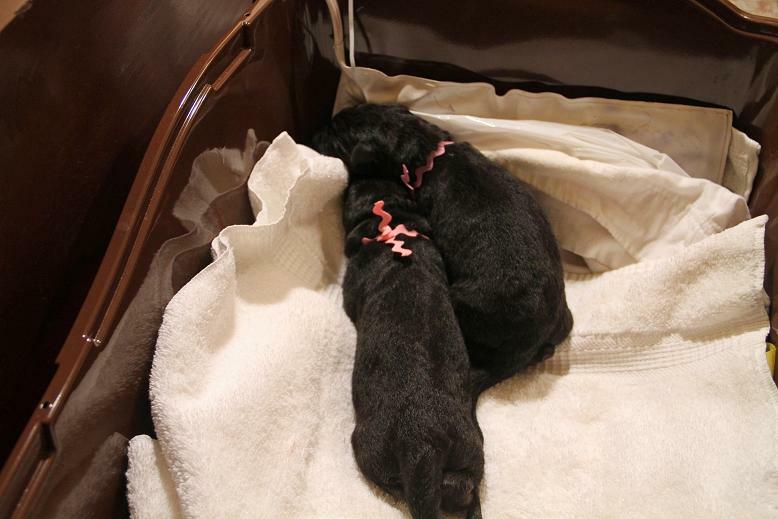 Violet and Rosie, the two first-born pups, are like twins. They are the most well-behaved little girls! They remind us of quiet little Asian schoolgirls — they hardly speak, they just sit up straight in class and get an A+ on everything. Violet is especially quiet. 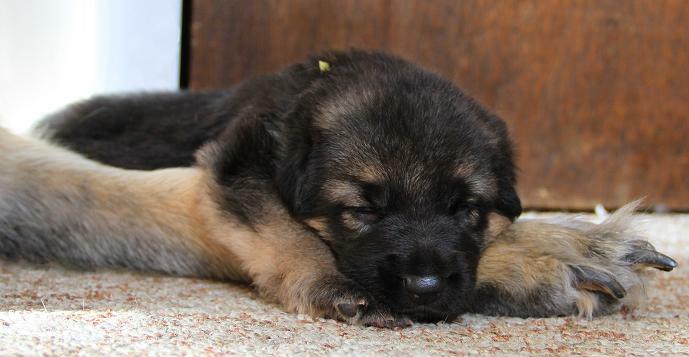 Most of the other puppies squeak all the time, but she just seems to know what her job is – nurse and sleep; repeat – and just goes about it without a peep. 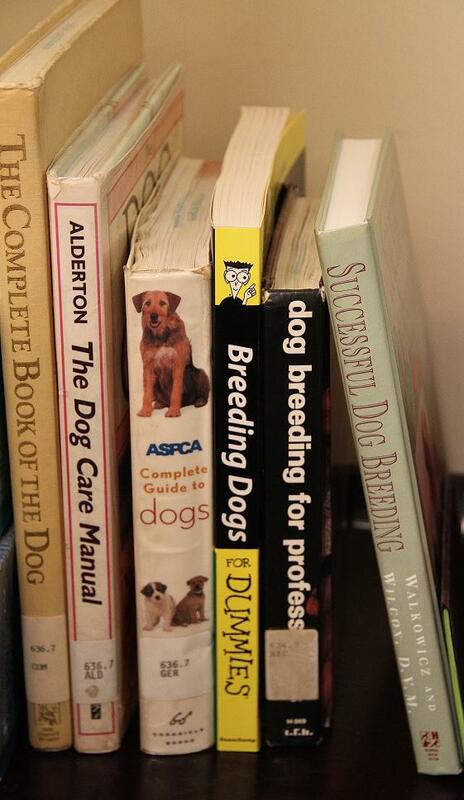 We think these dogs are both going to take to training like naturals. Maybe OBX dogs? Oh, for heaven’s sakes, they’re only a week old, I’m completely projecting, I know! Greenbean, oh my goodness. From the get-go, he was large and in charge, and he just keeps on getting bigger. 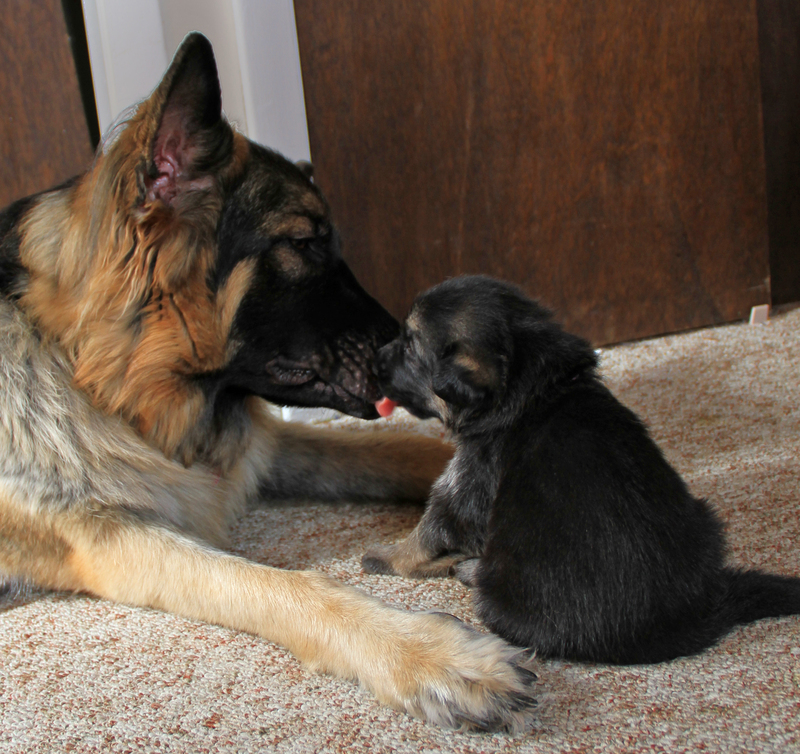 His head is markedly bigger than the other pups. He has no neck, seriously, just like a linebacker. We call him ‘Beefalo.’ He is so strong, and strong-willed. He wants what he wants when he wants it, and kindly stay out of the way. When we put him in front of Sassy so she can groom him, he wiggles so hard we can hardly even keep him there ’til she finishes! Greenbean might be Schutzhund material. We all just can’t get enough of observing and commenting on his strength. 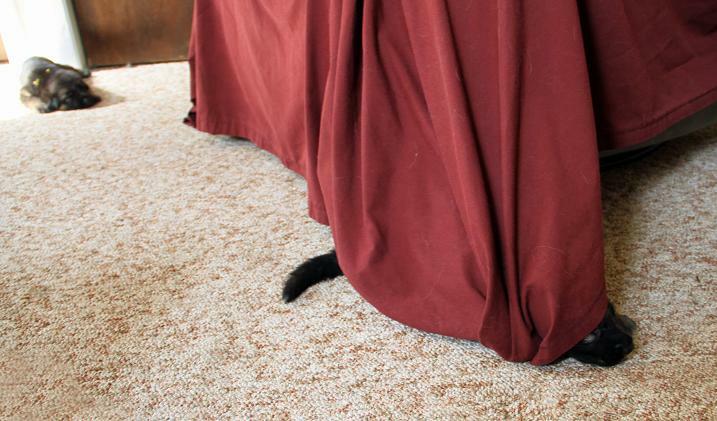 Lemondrop is the funnygirl in the litter, always doing something to make everyone giggle. 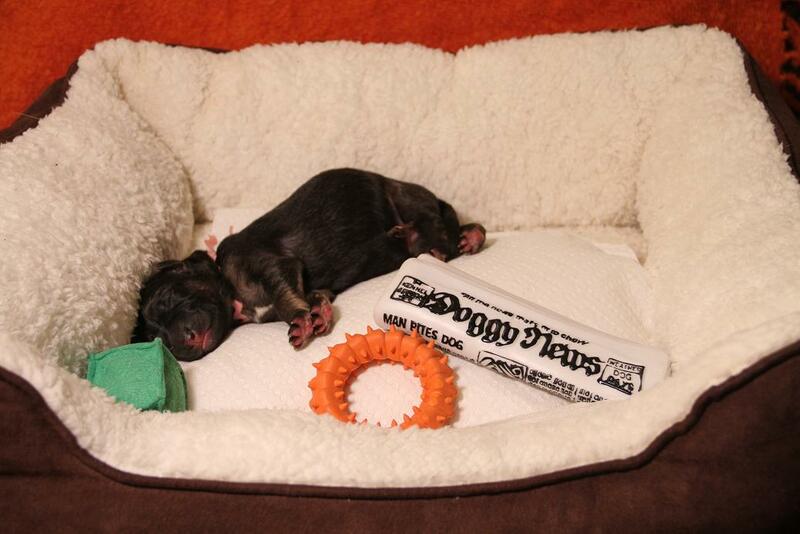 When she wags her tail furiously when she’s nursing, it never fails to make us laugh out loud. She also likes to play king-of-the-mountain on Mom, when she’s supposed to be nursing. Blanche is a little sweetie that everyone is always picking up to cuddle. She still needs extra attention, and we put her on first to nurse, and make sure she gets her fill. She is like the baby of the siblings, and makes you just want to hold her hand to help her along. She is doing great, though, and gaining weight in line with everyone else. Bluebeard, let me tell you, I’m going to have a hard time saying good-bye to. Everyone who is helping to care for the pups (there are 4 of us) has their one or two favorites, and I just can’t help it, he is mine. He is the most endearing little ball of fur I could imagine. It seems like he is always up to something cute, like snuggling up to one of his littermates, or rolling over on his back to make a big stretch and yawn. He also makes the most adorable, contented grunts when he’s nursing. They are doing great. Yesterday, we saw the first little glint of Violet’s eye, and today, 3 of them have a tiny bit of an eye open. 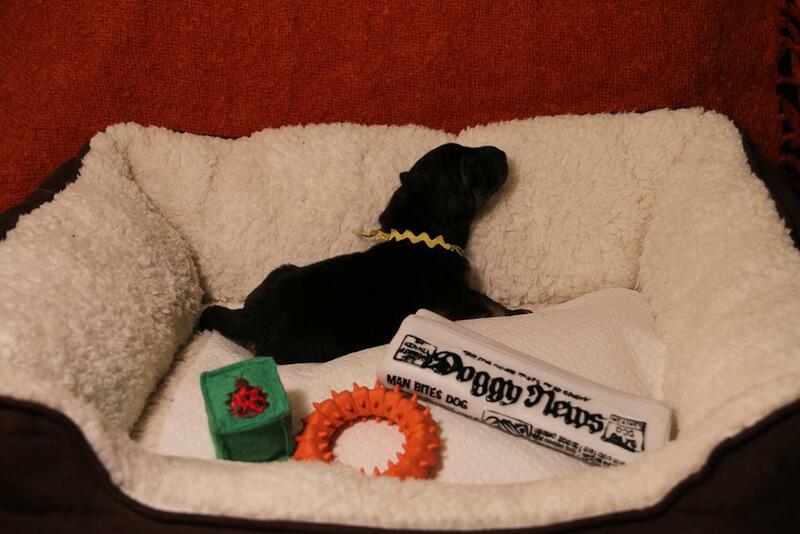 Not fully open, but slowly over the next few days, the pups will be seeing the world for the first time. They already wobble over to the corner of the box when Sassy comes to feed them. I think they can hear a little bit. Somehow, they know she’s there. Greenbean and Bluebeard are trying to get their hindquarters off of the ground to actually walk, but they can’t really stand up for more than a second. Getting around like a walrus still seems to be the most reliable method of locomotion. 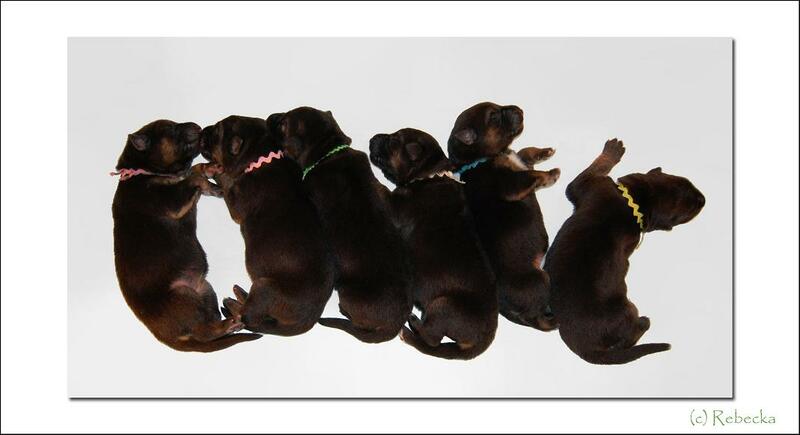 Yesterday, we changed all their little ricrac “collars,” because they were outgrowing them. We of course kept the old ones to give to the puppies’ future families, so they can see how little their dogs once were. 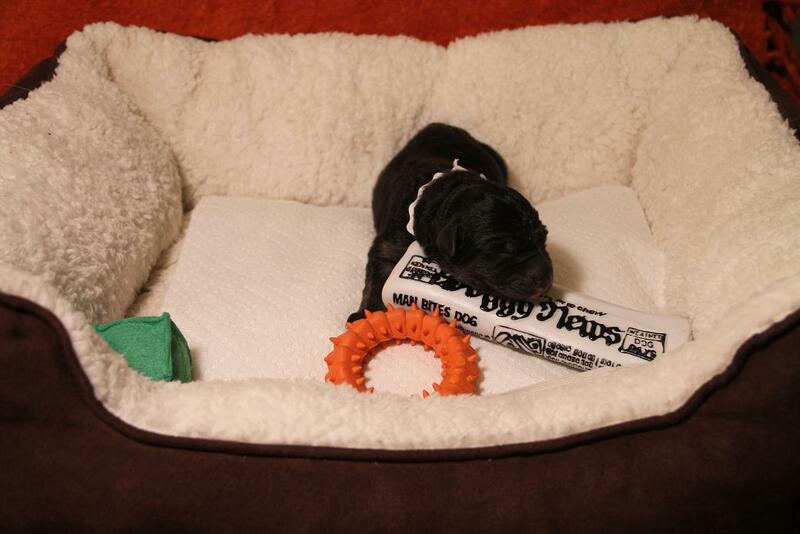 I’ve gotten 3 emails over the past few days saying — hey, more puppy pics, please — update the blog! So here are a few random pics taken over the past week or so, in no particular order. This is Greenbean demonstrating how puppies get around. 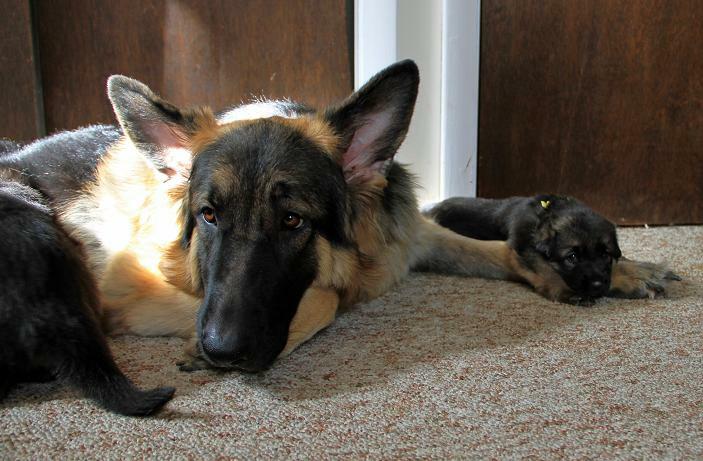 Sometimes they all curl up in a corner together…. 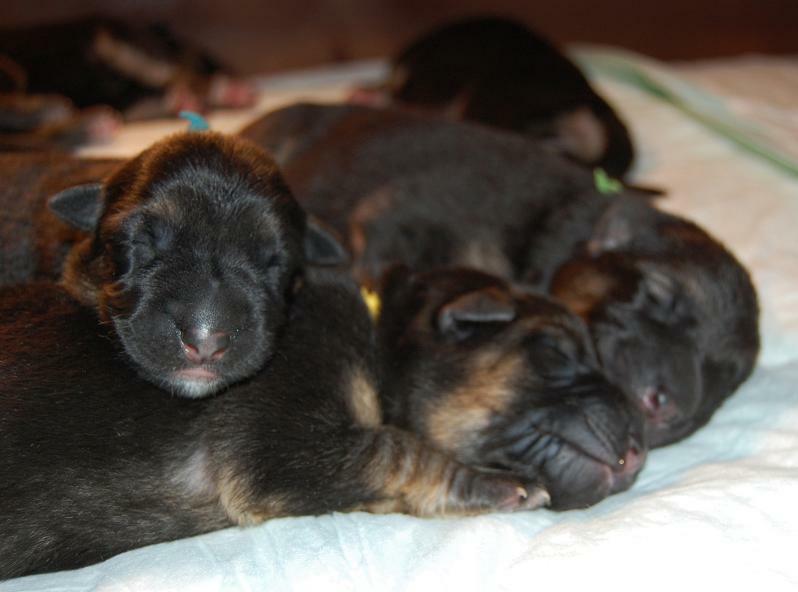 … or make a puppy pile. They are huge! Big and wobbling everywhere. 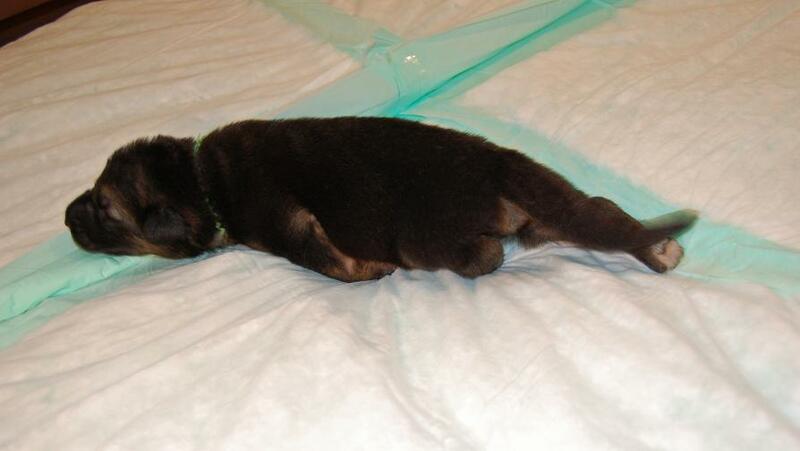 Here is a tired Greenbean after nursing. Here they all are nursing. Or fooling around. Lemondrop and Sassy wait for the others to finish nursing. 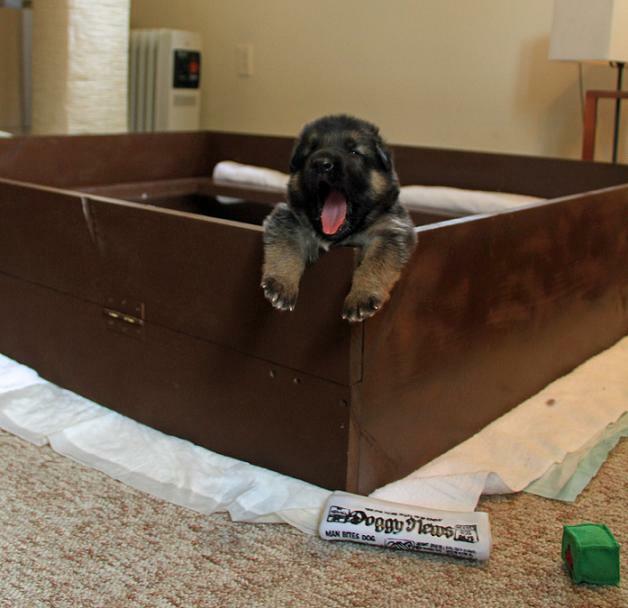 It’s fun to find new places to sleep outside of the whelping box. 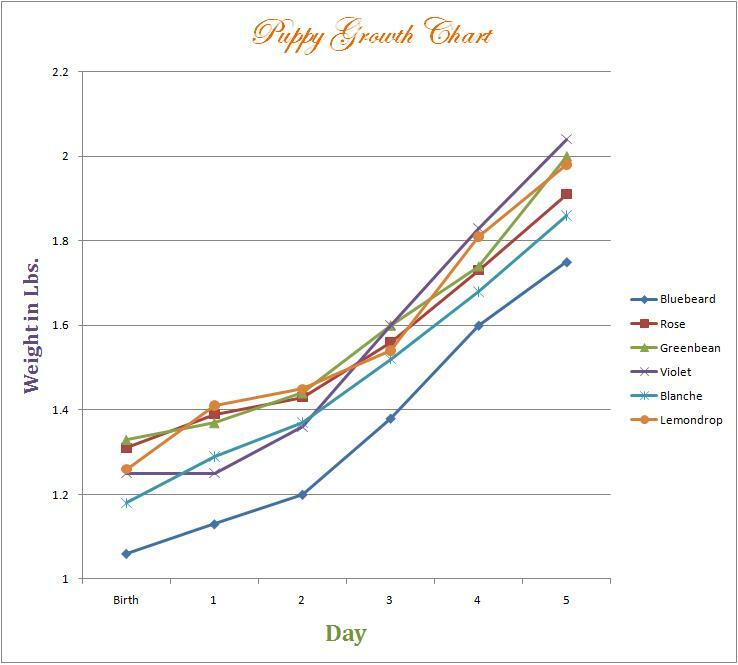 Latest growth chart. Somewhere is the notebook where I charted for last week…. in any case, they’re right on track. 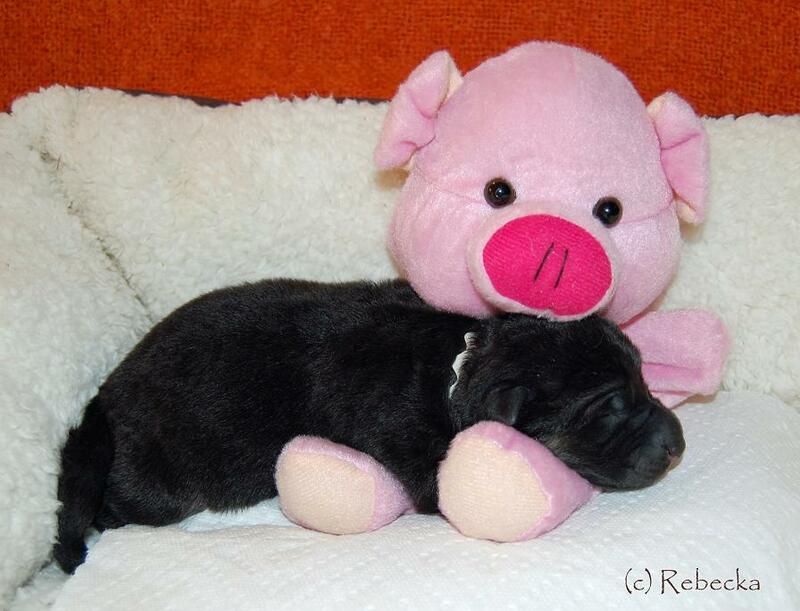 The cuteness factor is already off the charts. We can’t stop playing with them. 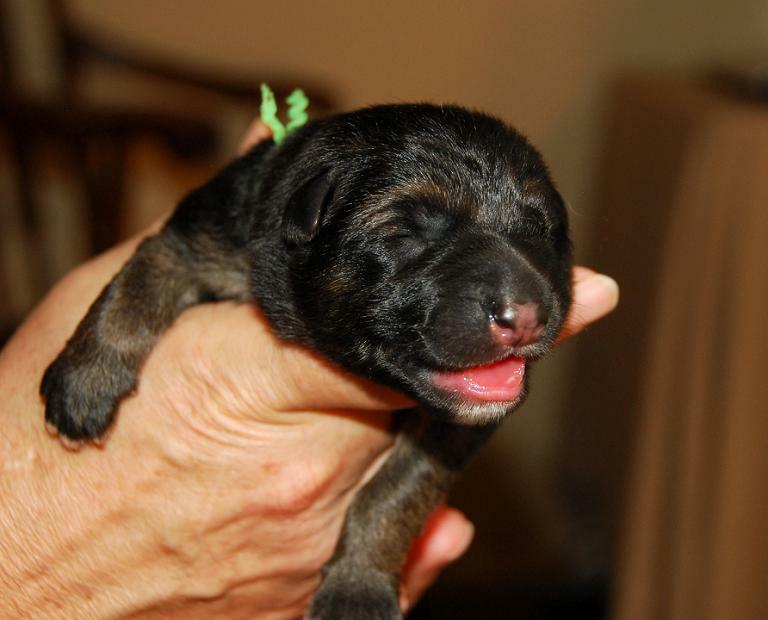 Click on the”2010 Litter Cont.” page for the continuation!